Microsoft is all set to introduce many productive offers to its users with Windows 10 Operating System and loads more with its Entertainment section. Windows 10 has been packed up with entertainment apps like Minecraft, Groove et al along with new look design and gaming solutions. 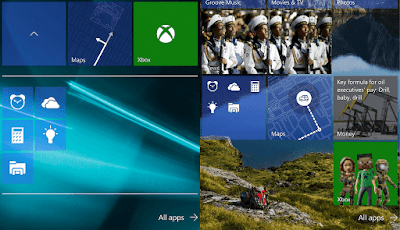 Windows 10 devices can enjoy all first party apps installed for free and run with refreshed design all the way which is concerned with most of the users to experience a new feel over the OS. Windows Insiders community revealed best entertainment features in Windows 10 which can be widely used with a secure experience. 1. Music:- Windows 10 has upgraded its Xbox Music with the latest of Groove by which users can access their music files in a single tap or click across the devices in a quick and efficient way of access. People are said to love the way Groove works in pinning and reshuffling the song which is gone a to be on repeat mode. 2. Movies & TV:- Previously it is called as Xbox Video and now it has been rechristened as Movies & TV. By this app, customers can have a moody change with its use. Groove and Movies & TV apps are said to be first introduced on Desktop platform of Windows 10 while to other devices to be rolled out post the release of this version and receiving the feedback. Look and Feel:- With the latest version of Groove one could access the music files on Windows 10 in a go which brings an improved experience feel to the customers. One could easily navigate between Music files and Menus which can be operated by Keyboard/Mouse and on a touchscreen with touch gestures. Can drag ones favorite songs into the playlists which is live and could control playback from the hover taskbar. In the Groove App, the theme can be set with the mood by going into Windows Settings. Customers can infuse their personality into Groove. Access Music on Different Devices:- With OneDrive Integration in Windows 10 it is flexible to access Music files between customers favorite devices without much difficulty. Once users upload all MP3 Music files into OneDrive, even iTunes purchased songs can be uploaded and later on can be accessed with Groove app in a variety of devices like Xbox, web, Android and iPhone version is said to be introduced soon. Windows Store and Music App:- One could get complete hassle-free access to Groove Music Pass by a premium ad-free subscription fee of $9.99/month or $99/year by which users could access to stream and download music from the Windows Store with a new experience. Windows Store has almost 40 million tracks (adding On) with the subscription customer can get access to the tracks where they could favorite songs, albums, and artists by which they could create custom radio. Groove Music Pass could be avail from selected markets and the price varies. Love having fun with Videos app:- Windows 10 is carrying Movies & TV app by which users can play movies, TV shows they loved along with their personal videos with a new feel of a playlist. Movies & TV comes in elegant design through the playback option of all imported personal videos play brings the fresh feel. Additional to it. MKV format also added by which the support has gained a new importance. Windows Store:- Through the Windows store customers can buy or rent movies and TV shows in HD formats with the means of Movies & TV on Windows 10 OS devices and could be shared among them too. Movies & TV app offers discounts and deals while users rent or buy any TV show or movie at the store.